On 10 Dec 2017, we celebrated the work of the SoA studios with our first ever end-of-semester open studio reception and discussion: EX-CHANGE. Thanks to our special guest critics Trey Trahan and Aaron Betsky who reviewed the work, our student/faculty moderators for coordinating a meaningful discussion, students who shared their work throughout the week on our Instagram channel, and each of the studios for their great work this fall. The end of the 2017 fall semester brought students and faculty together to present EX-CHANGE, the School of Architecture’s first ever end-of-semester open studio reception and discussion. Thus starts a new semester’s-end tradition to showcase the diverse and deeply inquisitive work at Carnegie Mellon’s School of Architecture. 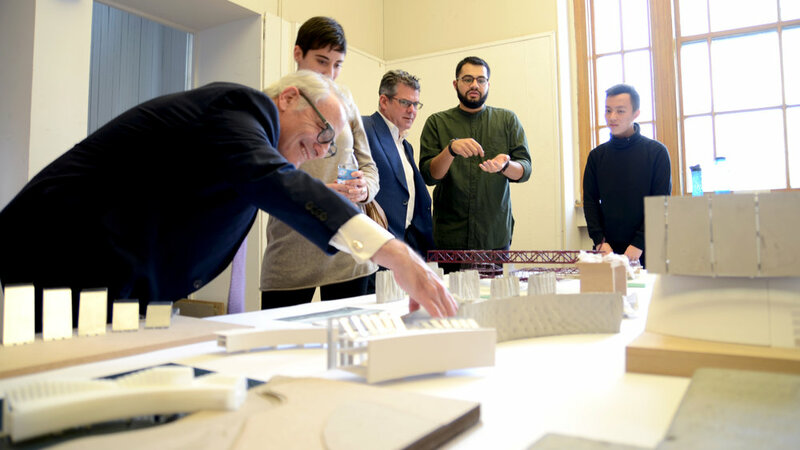 EX-CHANGE brought fall 2017 lecturers Aaron Betsky, President of the School of Architecture at Taliesin, and Victor “Trey” Trahan, Founder and CEO of Trahan Architects, back to the SoA to reflect on the semester’s work with architects, educators, and students. The afternoon began with an exhibition of student work in the College of Fine Arts studios, curated and presented by representatives from fourteen studios, ranging from the first-year Foundation Studio to the Masters of Urban Design studio. After a brief tour through short presentations, the school gathered for a moderated conversation between SoA students, faculty, and the two guest speakers. Covering a myriad of issues, the conversation was framed within questions that students had been asking in and about the studios, coupled with reflections from the Fall Lecture Series, specifically Betsky’s “Make It Alive: Beyond New Buildings” lecture and Trahan’s presentation on “Fragmenting Ecologies”. Fueled by the work on display, the panel addressed the much-discussed issue of representation in—and beyond—architecture. How do students allow the unique qualities of a site influence the design process, and also communicate those qualities accurately? The guests stood by the priorities they had demonstrated during their earlier visits and presentations. Trahan emphasized the repercussions of architecture beyond the site, and suggested that designers spend as much time thinking through design decisions as we do executing them, if not more. Betsky similarly lamented the lack of respect for the existing context in contemporary representational practices, and the obsession with the “jewel-like render” of brand-new proposals. “If you would believe your drawings, all of the world is inhabited by (white) people of the ages twenty to thirty-three, well dressed enough to be in product commercials,” he contended of student drawings. Meanwhile, Trahan encouraged risk-taking, his own life and path exemplifying the lessons and potential of embracing failure. With an aim to help situate the school within the context of pedagogy and the profession, the panel went on to discuss the specifics of the pedagogical model at Carnegie Mellon’s School of Architecture: the situation of the program between technology and the arts, the question of the kinds of professionals the school is producing, and the need for students to be more radical in addressing relevant architectural issues. While Betsky hailed the architectural design studio as “one of the most brilliant inventions of the post enlightenment era,” its educational goals were scrutinized. Betsky held that “solving the truss problem is not what your graduate education should be about.” As Trahan noted the profession’s loss of “confidence in taking risks,” Betsky advised students to consciously pursue a diverse skill set and ask what they can do with an architectural education “besides working in an office to design the next tallest skyscraper.” In all, the discussion praised the studios for their strong work in preparing students for architecture practice, but challenged students to discover voices and positions that are not as polite, to make radical design decisions that may not always work, yet have the potential to provoke radical change in existing systems.